Through the years, stationery has been an important part of good social etiquette. A hand-written note is something that can be kept and treasured and can show ones taste and flair. It is a way to make an individual statement. It is an easy to way express a thought or note of appreciation, send a love letter or touch base with an old friend. Stationery comes in thousands of colors, papers and styles. There is never a right or wrong selection. Personal taste plays the most important role. You could have something as simple as a stamp that you could use on blank cards and envelopes or go all out and get a stationery set which would consist of your own monogrammed self inking stamp, blank note cards, thank you cards, gift tags, address labels, gift labels and wine bottle tags. Through the year, there are occasions where a stationery box set would make a great gift! In January for parties attended during the holiday season. In February, as a Valentine’s Day gift. In March, for mom for Mother’s Day and in June, for Father’s Day. Then there are always bridal showers, baby showers and housewarmings to attend where a box of personalized cards makes a unique thoughtful gift that will be remembered. And lastly, the holidays are a perfect time to give friends and family a box of note cards with their name on it. 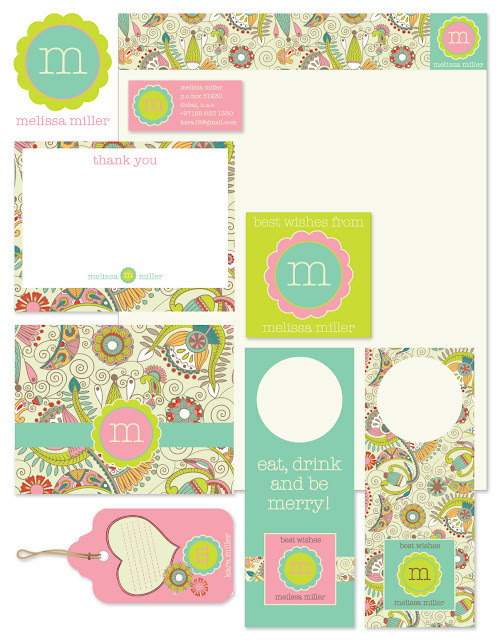 Below is a sample of what a stationery set consists of. This was done for a client who wanted something fun, colourful and whimsical. This set consists of a letterhead, address label, thank you note, blank folded note card, sticker, wine tags and a gift tag.